The Oregon Ducks use formations incredibly well on offense. Many also categorize them as a “spread offense,” which to most people means 4 wide receivers and 1 running back, or “10 personnel” in coaching speak (1 running back, 0 tight ends). Without getting too nit-picky about the “spread offense” phrasing, I’d like to bust one myth. They use a tight end. As an Oregon fan, you probably realize that. However, I bet you didn’t realize how much success comes from adding the tight end. The tight end, whether he’s on the line of scrimmage, off the line of scrimmage in a wing position or a little bit in the backfield like Coach Urban Meyer (Ohio State University) uses quite often, adds a special element to any offense. That element is the “extra gap,” which is often forgotten about in today’s “spread offense” environment. That’s why teams that use a fullback or tight end are so successful nowadays, especially when they can add QB-read elements. When you combine the “extra gap” created by a tight end or extra running back, and you add read elements, the defense must adjust. However, in Oregon’s case, they don’t really need to do that. I want to say one thing before I speak about the game with the Virginia Cavaliers — who are coached by Jon Tenuta, a very smart and talented defensive coordinator. They actually did an admirable job on a lot of plays, despite the scoreboard at the end of the game. Oregon used a lot of looks against Virginia, like stacked 4-receiver sets or 1 tight end and 3-receiver sets. Their is no doubt Oregon’s fast pace helps them catch defenses out of alignment — such as in the following scenario: In this pre-snap look, we see this is a tight end set. Also there are 3 receivers, with the slot receiver at the top of the screen and the tight end at the bottom. What we get is a 4-2 defense, with the strong side outside linebacker walking up. This is the same 4-2 defense as the next image — which was the stacked 4-receiver look. In the stacked receiver look, Oregon is really out-manned unless they run an option. This is a good way for Virginia to shut down or at least slow down Oregon’s running game. However, in the tight end look, Oregon has really good numbers versus the opposing defense. As I mentioned before, the defense should be adjusting by beefing up the amount of defenders in the box. But that is where Virginia failed. They continued to treat it as if there were only 5 linemen, when in fact there is a tight end. It’s 7 or 8 for the offense due to the QB read option element. That makes it 7 gaps with an option element, so essentially 8 gaps to defend. Versus 6 defenders. I should note that there is also a safety creeping up into the play, but he’s not in a position to make a tackle within 4 yards of the LOS and properly defend the pass — so he doesn’t really count. What Virginia appears to be doing is running a 3-deep coverage, which is probably a fire zone blitz, with 3 deep defenders and 3 underneath defenders. That walked-up linebacker appears to be a blitzer. What they should be doing is bringing the safety more into the box and adjusting the coverage a little bit to help him out, which is what they appear to do later in the game. Without going into too much more detail, let’s see how the play turns out. As we can see, the running play isn’t even all that pretty. Tenuta brings on a lot of penetration into the backfield with the blitz. But that doesn’t matter. They are totally out numbered and don’t have the talent to make up for it in the linebacker and secondary groups. You’ll also see Virginia No. 8 (the inverted safety) come down and outside way too far, either to defend the curl/flat area or because he over pursues and the running back cuts up, one or the other. The safety also displaces himself. In reality, the only person who has a shot at making this play is No. 90 for Virginia, who was double teamed and came off the block pretty fast. So, while this appears to be a pretty simple play by Oregon, it’s causing all kinds of mathematical problems for Virginia. They didn’t count the box and they didn’t adjust their coverage or blitz. They simply treated Oregon like a 4-receiver “spread offense,” as they did earlier and got burned. As I mentioned earlier, Coach Tenuta is smart. He doesn’t like to be burned twice, so let’s take a look at this shot from later in the game. Notice the “Heavier” defense with the safety up closer to the LOS. Here we see a somewhat similar scenario: a running situation. Now look where the safety (No. 8) is. He’s 6 yards away instead of 9 yards away, which is where he was before. In addition, he’s much more inside and he’s playing much more conservative (in the box) after biting hard the last time outside. It also appears we have 3-deep coverage again, but without the blitz. Virginia basically has a 4-3 box. If there was no possibility of the read option element, Virginia would have solid numbers to defend the running game. Again — 8 potential offensive players because we only count the QB when he’s a potential ball carrier. Reading the Will linebacker on Buck Sweep. But, alas, there’s that pesky read option element. Oregon is going to run a version of Buck Sweep, an outside running play where they pull linemen. Besides the fact that they have the tight end, when Oregon pulls their offensive linemen they are, in essence, moving their gaps around. There is one less gap inside, and one more gap outside and that means the defense needs to fast-flow to replace that pulling gap with the linebackers. But this doesn’t happen because of the read option element. Marcus Mariota appears to be reading the Will, or weak side, linebacker. I’m not sure if Mariota is really reading the Will, but the Will seems to think so because he steps up and attacks Mariota — which we’ll see in a few moments. Oregon essentially turned this into a 4-2 box again and that makes it an 8-on-6 advantage for the offense. Oh, and and don’t forget they are moving gaps by pulling the linemen. Oregon moves gaps in two ways; the first is the pulling linemen, as we discussed, and the other is more discreet. That is when the receiver “fakes” laziness in his blocking before crack blocking No. 8, the inverted safety, right as the tailback cuts up field. The Red line is the defensive player movements, the Yellow line is the offense. Let’s stop chatting and let the film show this play in all it’s glory. Now, there is one problem on this play for Oregon, and that’s Virginia’s No. 55, the defensive tackle to the direction of the play. 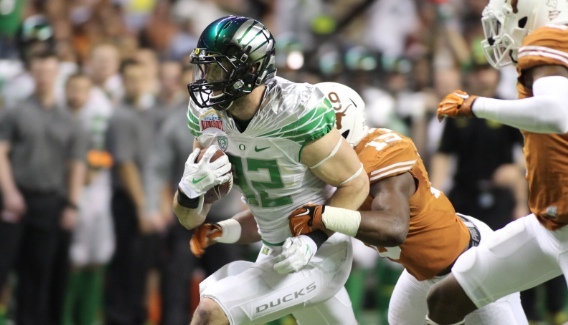 He goes unblocked, but luckily Oregon’s tailback outruns him. Coincidentally, center Hroniss Grasu, No. 55 for Oregon, should have picked him up — but he didn’t end up blocking anyone, so that’s a wash and wouldn’t change the outcome of the play. In a perfect world, the right guard for Oregon (Hamani Stevens No. 54), picks up No. 13, the middle linebacker, and the right tackle (Jake Fisher No. 75), ends up on the corner that the running back makes miss – like we drew up. As we can see, the result isn’t too different from the first play. The problem lies in Virginia and Coach Tenuta’s answer for Oregon’s first play we examined, but now has loaded the box. However, his backside linebacker isn’t pursuing properly — either due to a read option element or a faked read option element by Oregon. This prevents them from accounting for the moving gap of the puller. There is really no great way to defend this kind of formation out of cover-3 or any other 3-deep coverage for Virginia with their talent disparity unless they get exotic with their run blitzes – where they already got burned once by this point in the game. The tight end and the “extra gap” element that the position provides, is just too tough for Virginia to handle. There is an adjustment for Virginia, using split coverage or quarters coverage principles, like I discuss over at Strong Football and in my e-book, “4-3 Quarters Match-up Coverage Principles.” But even that would mean making tackles in space, which is hard enough to do with somewhat equal talent. The questions Coach Tenuta and other defensive coordinators must ask is, if they want Oregon to run or pass the ball. My suggestion, which is the philosophy behind my e-book, would be to defend the run game with quarters coverage. The strength behind quarters is that it defends vertical passing plays well but also lets you keep people inside the box. It also has built in answers for defending the quick-out route and bubble concepts. I’m sure Coach Tenuta went with what he felt his defense could best execute and to combat what he thought was the most dangerous element of Oregon against his defense. Considering their talent on the defensive line, it wasn’t a bad decision. He probably thought they could have the best chance keeping the “Lighter” 4-2 box and hoping his defensive line could make plays, which they actualy did several times. But, when Oregon runs the ball and someone on defense takes a bad angle, it’s usually a huge gain for the offense. At least when Oregon passes the ball, there’s a 30-45% chance that the ball will fall incomplete due to a bad throw, a tipped pass, or something else that went wrong. So even if you take a bad angle, there’s a fairly high chance something else will fail. That’s a big reason why I believe in stopping the run game versus any “spread offense” that shows the initiative to run the ball fairly often.